Northrop Grumman has awarded Cobham an $8 million contract to build a motion control technology for use in two microwave instruments Northrop is developing for the National Oceanic and Atmospheric Administration’s Joint Polar Satellite System program. 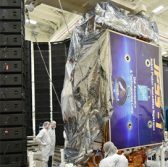 Cobham said Thursday it will develop the motion controller system at its Hauppauge, New York-based facility for integration with the Advanced Technology Microwave Sounder units of the JPSS-3 and JPSS-4 environmental satellites. The ATMS tool will work to help NOAA recover atmospheric temperature and moisture profiles for civilian operational weather forecasting through sounding observations. Jim Barber, senior vice president and general manager of Cobham’s integrated electronic solutions unit, said the company’s actuators, DC motors and controllers for space, military, and commercial applications are designed to operate in harsh environments. NOAA finances the development of JPSS satellites and NASA oversees procurement of flight systems, ground system components and engineering and launch services for the program.